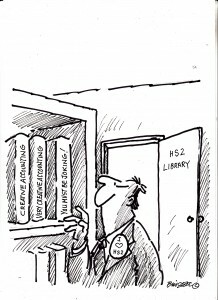 STOP HS2 | Higgins set to deliver more false promises with HS2 report on Monday. Higgins set to deliver more false promises with HS2 report on Monday. On Monday, Sir David Higgins is due to launch a report into HS2 called ‘HS2 Plus’, which is intended to mark the sixth relaunch of the beleaguered project. Besides trying to invigorate more support from the Northern Cities which would see more economic activity dragged away from them toward London, the Australian who delivered the Olympics for four times the original budget of £2.4bn, and oversaw the increase of National Rails debt is due to say he can deliver HS2 for less money by reducing its connectivity and ignoring the fact that inflation exists. It has been heavily trailed that Higgins is due to cut the final cost of HS2 by building the Northern section at the same time as the Southern section. Besides that being completely impossible, even if more corners are cut of Phase 2 of HS2 than have been cut on Phase 1, no inflation has even been added to the projected costs of HS2, which are still being calculated on 2011 prices, meaning that any claim that the £42.6bn cost of building HS2 can be cut by building it more quickly is completely fraudulent. It has been trailed that Higgins will propose removing the link to the Channel Tunnel through the London Borough of Camden, at a saving of £1.5bn, which reasonably equates to the cost of compensation which would be required in just Camden without the HS1-HS2 link. If inflation had been added onto the original £42.6bn cost of HS2, then saying it could be built quicker could bring that down. However, inflation has never been added to any costs involving HS2, so saying the costs can be brought down by building it more quickly are completely false, because all costs are still based on 2011 prices. In fact, when HS2 Ltd calculated forecasts for electricity price increases which showed they would go up 87% in 18 years, the decided to ignore them when calculating the running costs for HS2. Using the exact same formula which HS2 Ltd are using to calculate inflation and GDP growth when they talk about the benefits of HS2, the 2011 costs should be multiplied by a minimum 27.7%, which would but the pre-cut £42.6bn costs of HS2 at £54.4bn at 2014 prices, or with a £1.5bn cut, £52.5bn. It is also completely impossible to start building Phase 1 and Phase 2 together, unless Phase 1 is stopped right now, due to the length of the Parliamentary process required for either phase. The question which has been missed is whether or not local authorities, passenger transport executives or local businesses will have to pay for HS2 stations. In the case of Crossrail, the DfT did not pay for the majority of the project: that was made up via direct contributions from the Greater London Assembly, additional business rates paid by local businesses, and Transport for London. MPA have 75 unanswered questions on HS2, as Higgins hints at more delays. The HS2 is merely an extension of the French TGV and their intention to have a High Speed rail link THROUGHOUT Europe, utilising the channel tunnel link.